This beautiful villa is absolutely amazing!Tastefully furnished, it creates cozy and homey environment to make your holidays unforgettable! House features flat screen TVs all over the house, nice and comfy bedding, and simply fabulous kids rooms for your children! Home has wonderful crystal clean pool with nice fence for more privacy and relaxation. 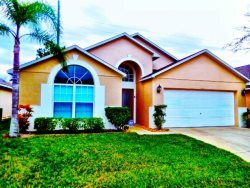 Villa located in beautiful Hampton Lakes community!A private neighborhood set among rolling hills and orange groves, Hampton Lakes is an ideal location for Disney vacation rentals. Guests also have access to a community pool, a sand volleyball court, tennis courts, and a playground for children. Located on Hwy 27, Hampton Lakes is only minutes away from the new ChampionsGate world-class golf resort and Walt Disney World. The close proximity to I-4 offers easy access to the beaches of the Gulf Coast or east towards Daytona Beach, Cocoa Beach and The Kennedy Space Center. Beautiful Hampton Lakes villa with Flat Screen TVs, Pool Table, Free Wi-Fi and crystal Clean Private Pool!